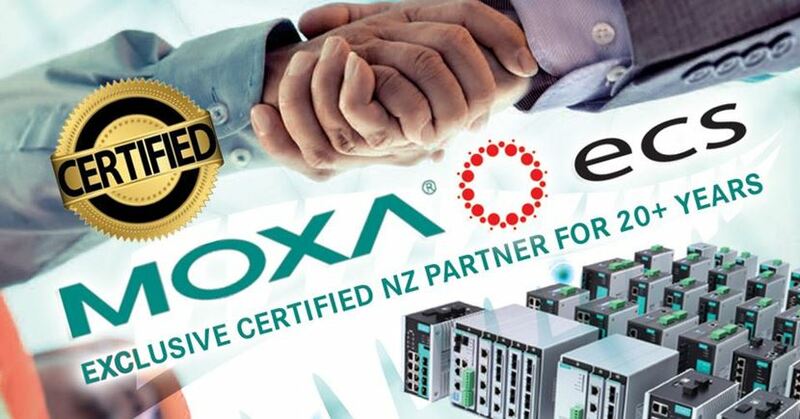 For over twenty years now, ECS has been New Zealand’s exclusive distributor and certified partner of MOXA Automation & Networking. Our dedicated team of fully trained professionals are here to help guide you through MOXA’s extensive library of quality automation & networking products, engineered for today’s technologies and beyond. As we approach the wireless age of Industry 4.0, the demand for expertise in the area of the Industrial Internet of Things (IIoT) is rapidly increasing. The MOXA NZ team at ECS have the training and qualifications to remedy legacy device data collection/wireless transfer to the cloud and SCADA control systems using the MOXA range of modern I/O devices and software. We help you enable IIoT connectivity for operational efficiency and maximum business profits. Of course, you can trust that we also support a wide range of devices aside from IIoT, Moxa has over 30 years of experience enabling connectivity for a variety of industrial applications, including manufacturing, transportation, power, and energy. ECS has been delivering this technology to NZ for more than 20 years now and we are looking forward to the next 20 years of exciting developments as we enter a new age of connectivity. If you would like to discuss an up and coming project or simply learn more about our automation products, feel free to contact us on 0800 849 2211 and ask for the automation department, or fill out our contact enquiry form below. You can also browse our Automation & Networking product range online by following the link below.